Media Chiropractor, Media, Springfield and Wallingford PA - Patricia Salvitti D.C.
Media Chiropractor, Patricia Salvitti D.C.
As a safe, conservative approach, chiropractic is a natural solution that relies on your body’s ability to heal itself—if there isn’t any interference. 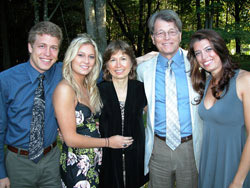 Dr. Pat and her family. At Media Wellness Center, Dr. Pat offers a course of chiropractic treatment with natural health care and natural health solutions, always respecting and working with the body’s incredible ability to heal itself. When the human body is thrown out of balance, it will react in a certain fashion until balance returns. How we respect and work with the body during this volatile phase determines whether we have an uneventful recovery or we are pushed into more chronic and serious health issues. Dr. Pat will provide you with the chiropractic care and wellness tools to reach your optimal health. Dr. Pat Helps Media, Springfield and Wallingford Residents Feel Their Best! Be sure to visit our practice site for Media Wellness Center and check out Dr. Pat’s online store! Our Media, PA center offers comprehensive services for relief and wellness, with a group of caring professionals to help you overcome your health challenges and feel the very best you can. If you think that you or a loved one are a good candidate for chiropractic care, contact Media Wellness Center to arrange a thorough examination with Dr. Pat.